For Ubuntu, Fedora, OpenSuse, CentOS: Microsoft’s Skype division has released a “major” update of Skype for Linux, its proprietary voice, video and text messaging client. The newly released Skype for Linux 4.2 comes with tons of improvements, many bug fixes – and several little tweaks called features. In this release Microsoft claims to have “increased” the stability of the Skype for Linux client “when logging in from a Microsoft account”. The new user interface makes it easier for users to find the voice message functionality of the client in the options dialog. Subscription status for calls to landlines and mobile phones can now be checked through a link from Skype’s main window. Also improved is the size of the Skype icon, so it better fits in different desktop environments – for what its worth. Screen sharing gets a tweak too; now when sharing the screen in a multiple monitor setup, you can share only the screen with the call window. 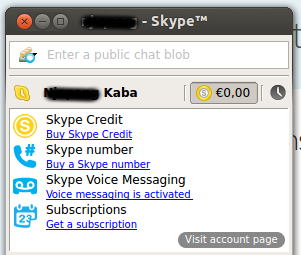 Skype 4.2 for Linux is available for Ubuntu, Debian, Fedora, openSUSE and CentOS for 32- and 64-bit systems. The download page also includes easy to follow installation instructions. Users of 64-bit Debian and Ubuntu need to install the libasound2-plugins:i386 package to get the Skype client to work correctly. [Update] There is an ongoing argument on the web on how secure it is to place a call via Skype. Torrents of comments have poured-in on blogs that have made the matter public. What am I talking about; articles like this: Big brother Microsoft listens in to your Skype IMs and this too: Think your Skype messages get end-to-end encryption? Think again have deeply exposed the poor state of the Skype framework. Now you know.